While some people moving to France will take their right-hand drive car with them, at least for the first few months, others will want to make a fresh start on the road by buying a left-hand drive vehicle when they get there. There are several benefits to this approach, not least safety – overtaking and using roundabouts whilst driving on the right hand side of the road is much simpler and safer when you re at the wheel of a left-hand drive car in France. Those who know and love France will be very aware of how proud the French are of their own products. So it’s no surprise that many French drivers are loyal to the big French brands such as Renault, Citroën and Peugeot. Japanese brands, as well as German brands VW and Audi, are popular too, but it’s with the French brands that you are likely to find the best deal, not just for the initial purchase but also for future repairs and parts. There will be more choice and plenty of car dealers offering you a perfect used car (voiture d’occasion). Once you know what kind of used car you would like, take the time to assess average prices for the make and model. In France, a good place to start is by buying the fortnightly car-buying bible called L’Argus (in circulation since 1927), which is available in all good Presse outlets on the French high street. Prices listed here are seen as industry standard – it s also used by insurance companies when processing claims and premiums – and the buyer should really aim to pay within 10% of any vehicle price listed therein. It’s also good to check les petites annonces (classifieds) in the local French newspaper, such as La Dépêche for the Midi-Pyrénées, Charente Libre, Nice Matin, La Voix du Nord in Nord-Pas de Calais and Sud-Ouest (you can see a full list of French regional newspapers here). If nothing else, it gives you the chance to sit and enjoy a leisurely coffee in the village square whilst perusing the classifieds! Another good place to spot a bargain is in the little roadside garages you find in the countryside. They always offer better value for money than in the big towns, so it’s often worth a two-hour drive to bag a bargain. You can also ask your local garagiste if he can recommend a car for sale – he will be in the know locally, with plenty of contacts and his only reward would be the job of servicing the car after you buy it. Another option to consider – and this comes recommended from some FrenchEntrée forum users – is to buy a used car from Belgium or Germany. There are many well-maintained websites in France listing a huge selection of used cars for sale. Among the leading ones are Auto Scout, La Centrale, Paru Vendu and Le Bon Coin as well as car journals like Auto Journal. You can search according to your own specific criteria such as marque (make), modèle (model), prix (price), année (year), kilométrage (mileage) and carburant (engine/petrol type). If you end up buying from a car dealer, they will handle most of the paper work, but it s important to be aware of the requirements. Of course, this is doubly important if you buy from a private vendor. Provide a certificat de cession (certificate of transfer and document of sale) in triplicate completed and signed by the person whose name is on the certificat d’immatriculation (carte grise). The seller must forward a copy to the Préfecture (the region s administrative headquarters) within 15 days of the date of sale. The certificat d immatriculation must be struck through diagonally in indelible ink and the person whose name is on it must write along the line, “Vendu le (Sold on the ) followed by the date and, preferably, the time, and then sign it. Give the buyer a certificat de situation administrative – often referred to its former name certificat de non-gage – if the buyer asks for it. This is not needed for registration purposes but certifies that the car is not being held as security against a loan (valid for a month) or that there is no legal opposition to its sale (valid for two months). Provide the procès-verbal of a contrôle technique dated not more than six months previously (or within two months if a re-test is necessary). This is not required for a motorcycle, trailer or car/van under four years old. Complete his portion of the certificat de cession. Effect the re-registration of the vehicle within a period of one month from the date of sale if the vehicle is in circulation. If the vehicle is not being used (i.e. because of repairs to be done), the registration process does not need to be effected within one month, but it is advisable to do so as soon as is convenient, bearing in mind the contrôle technique must be under six months old to register the vehicle. If effecting the re-registration by post there is a tear off strip on the certificat d immatriculation which should be carried by the new owner to comply with the requirement to carry vehicle documents at all times. Another way to make great savings when buying a second-hand car in France is to buy at auction. Contrary to popular belief, foreclosures and bankruptcies are often not the main source of second-hand cars being sold at auction. The vehicles can come from leasing companies, credit and financing companies, car manufacturers and their distribution networks, large company car providers renewing their fleets and even the government EDF, La Poste, etc). In the case of auctioneers such as Alcopa Auction, Five Auction and Encheres VO (in Bordeaux, Toulouse and Marseille) the cars are listed on a website with details of the car’s contrôle technique status and the vehicle’s specifications. Vehicles will have undergone vehicle safety checks (brakes, lights, shocks, damaged vehicles) at a Technical Inspection centre. You can also find a great value used French car at the state public finance auctions, the Ventes Domaniales. You can attend the sale in person and no previous registration is required. Each physical sale is preceded by an exhibition where staff are on hand to answer questions and advise the potential buyer. You are usually able to sit in the car and turn the engine over, though a test drive is usually not possible. In the interests of customer trust and transparency, reputable auction companies are at pains to ensure that the photos on their websites reflect the state of the vehicle, allowing the customer to make an accurate visual inspection. Pictures are taken from several angles to show the buyer every detail, be it a scratch, equipment or other specification. A notice displayed behind the windscreen is used to show the exact model, its mileage, options and/or equipment, as well as the car’s condition, the sales cost total and administrative charges. 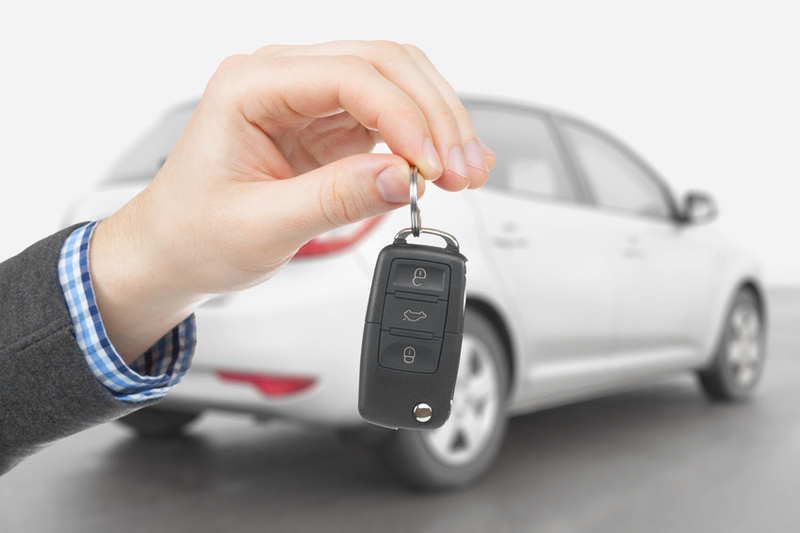 Some vehicles, especially ex-rental cars, come with a full maintenance history. In the sale room on auction day, the auctioneer directs the sale room and explains each vehicle’s technical and administrative specifications. The vehicles are paraded one after the other according to a predetermined order and time slot (keep an eye on the sale catalogue). When the vehicle has been pronounced ‘vendu’, the buyer will then present their ID and either pay in full (in cash only up to €1,000 max or provide a security deposit (cheque, bank deposit). When it comes to the bidding, sit in the stands and bid using hand signals. Bidding begins at a reserve price and bids usually go up in €100 increments. If you can not attend the sale, it’s possible for a mandate to be issued to the auction firm to purchase on your behalf. This ‘absentee bid’ is a written instruction from the buyer directing the auctioneer to bid on your behalf to a maximum amount specified for each vehicle. There are also online car auctions. Auction houses offer varying warranties for purchased vehicles, but you can expect a three-month warranty when purchasing any used French vehicle less than five years old and with under 150,000 km on the clock.